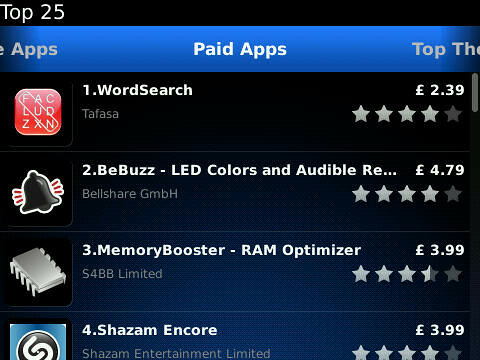 It's not the App Store but the new release of BlackBerry App World carries on adding features. The new version includes cheaper apps, new ways to find apps that will take advantage of the new gestures in BlackBerry 6 and a new payment system that makes buying apps even easier. From just a handful of apps in the first release, App World now has over 2,500 BlackBerry apps in the UK (and more in the US) - not counting games (nearly 1,000), ebooks (just under 500) and themes (over 1,500). Developers can choose new lower price points for apps ($0.99 now and $1.99 apps soon); these lower price points may be more popular with developers in conjunction with the promised payment service that will allow them to sell subscriptions, upgrades and extra levels inside an app - so you'll only pay 99 cents for the game and then buy new levels as you go along rather than being put off by a higher price for a game you don't know how much you'll play. App World 2 adds payment by credit card as well as PayPal (Visa, MasterCard and American Express). So far only AT&T in the US is supporting the option to buy apps by charging them to your monthly phone bill, but RIM expects other mobile operators to let you do that soon. If you make PayPal your preferred way to pay (go to My Word in App World and choose Payment Options), you won't have to type your PayPal username and password in every time. Whatever payment method you choose you will have to type in a password every time you download an app - even a free app - because App World 2 uses the new BlackBerry ID system. We're expecting to see this show up in lots of other places (as a way of finding someone to add them to your BlackBerry Messenger perhaps?) because it gives you an ID that's tied to you rather than to your specific BlackBerry handset the way the PIN is. That means if you get a new handset it will be easy to re-download all the free and paid apps you were using before. Your BlackBerry ID can store your credit card, PayPal and carrier billing info - though you don't have to save the credit card number if you're not comfortable doing that. Typing in a password is certainly better than filling in PayPal or credit card details every time, but it's an extra step for free apps that we suspect will irritate many users. In preparation for BlackBerry 6 devices, where you'll be expecting multiple tabs to organise other apps the way you can organise the home screen, App World now has multiple 'top 25' lists; as well as top free apps and top paid apps (based on a combination of user ratings and download numbers), these now also include the newest apps, recently updated apps and the top 25 themes (now in their own list). You can also use the camera to scan a QR barcode to download an app. You have to be on the front screen of App World for this to appear in the menu and we couldn't find any BlackBerry-app-advertising QR codes to test it with, but the QR-scanning already works well for adding contacts to BlackBerry Messenger so this looks like an excellent way to look up the app you want on the Web version of App World and snap the QR code on screen rather than waiting for the email with the download link to arrive.